Back in January of 1988 I purchased my first computer. It had a 10-megabyte hard drive; the salesman assured me, “That’s all you’ll ever need.” It was not inexpensive, and neither was the printer that I got that day, but I was able to rationalize the extravagance because as a professional writer, I needed to upgrade my tools. So I went back to writing the way I’d been doing it for over a decade at that point, with a lined yellow tablet and a pencil. That allowed me to work through a scene as the words came to me — sometimes quickly, and at other times glacially. There are inevitably those periods when inspiration is elusive, so while trying to come up with the next amusing bit of dialogue, I’d stare at the ceiling, or glance out the window, or study my pencil. Before long I’d be wondering why pencils have that hexagon shape, and why are so many of them yellow… and how the heck do they get the lead to stay inside there!? In other words, the writer part of my brain would be given a little time off by the lobe that generates idle speculation. I have since learned that the six-sided pencil has a couple of virtues: supposedly it is easier to grip than a round pencil, and it won’t roll off your desk. 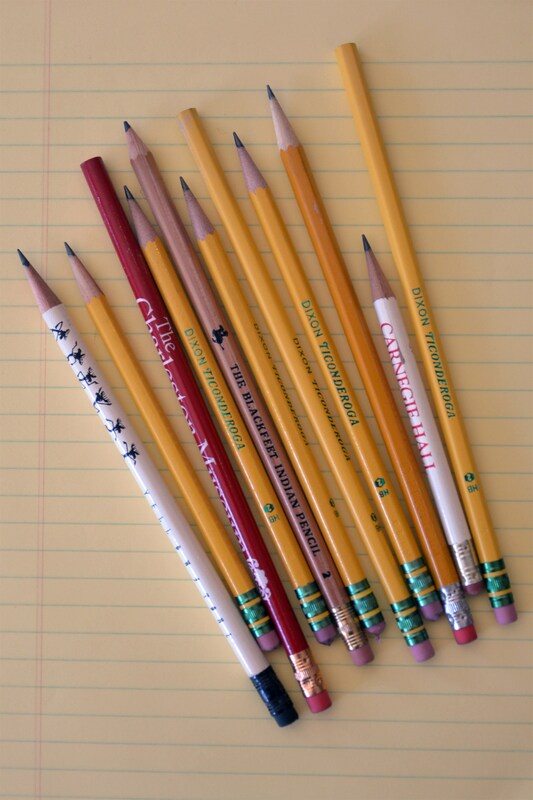 Round pencils are more common as souvenirs because, according to Pencils.com, they are easier to print on. The majority of them are yellow because the premium pencil of the late 19th century, called the Koh-I-Noor, was yellow. Other manufacturers followed suit to convey that their products were high-quality, too. The precursors of the pencils we use today go back to the 1500s, but it was a man named Joseph Dixon (along with his son-in-law) who mechanized pencil manufacturing in the middle of the nineteenth century. So, you’re wondering, how did they get the lead to stay in there? OK, as you probably know, even though we call it lead, it really isn’t — it’s graphite mixed with clay. Anyway, while workers in one part of the pencil factory are making those skinny rods of graphite, other workers are cutting cedar blocks into slats, and grooves are then carved into the slats. The graphite rods (called “writing cores” by pencil professionals) are glued into the grooves. Another grooved slat is glued onto the slat that has the writing cores, creating a pencil sandwich. That sandwich is sliced into individual strips, which are sanded and painted. The ferrule — that’s what the metal ring is called — is crimped into place on the end of the pencil, and an eraser is glued into it. This process is repeated with impressive frequency: Around fourteen billion pencils are made worldwide every year. That suggests I’m not the only person on the planet staring at my pencil and hoping for inspiration to strike.